I’m a parent of two teenagers. I know from experience that teens and tweens can be hard to please on vacation. That’s why I’ve put together this Albuquerque itinerary especially with them in mind. And don’t worry, my own teenager has given it his full endorsement. Hotel Chaco (2000 Bellamah Ave. NW) in Albuquerque’s Old Town is one of the most impeccably designed hotels that I’ve ever seen. The idea was to pay homage to the ancient civilization that once occupied Chaco Canyon, a UNESCO World Heritage site & one of the most significant archaeological locations in North America. As you enter this hotel, you’ll truly feel transported. For being such a chic hotel, it’s still comfortable and inviting for families. The rooms are modern and spacious with the wet bar stocked with complimentary bottled water and snacks. The bathroom with its walk-in shower and tub is huge and beautifully done. You also have your own deck with seating. Of course, your kids will make a beeline to the large pool, which is well used during Albuquerque’s hot summers. Teens also will find cozy spots around this hotel to just “veg out” and catch up on social media. Yes, the hotel does have free WiFi. Rates start at $239/night plus $30 resort fee. If you’re looking for more budget-friendly option, El Vado Motel (2500 Central Ave. SW) is affordable while still being super hip. This Route 66 motel, originally opened 1937, was left abandoned for years. But after a complete restoration, the motel has reopened as the most happening place in town. The small pool is only about 3 feet deep but still attractive to teens. The motel has one room with two queen beds; however most of the other rooms have a king with a sleeper sofa to accommodate families, as well. Rates start at $149 during high season and drop to $140 in low season. I think taking the “Best of City” tour with ABQ Trolley Company (boards at Hotel Albuquerque in Old Town) should be the first thing on your “to do” list. This nearly 2-hour tour gives an excellent overview of the city and takes you into some neighborhoods that likely wouldn’t have been on your itinerary. Your guide’s commentary is supplemented by video clips that play throughout the tour. For example, we drove through a neighborhood used in the movie Wild Hogs and then saw the clip of the scene. In fact, the city has been featured in several movies and television shows, most notably Breaking Bad. If you’re a fan, you’ll recognize several locations. The tour also includes tons of Albuquerque and New Mexico trivia, like did you know there’s an official state question? Yep, it’s “red or green?” as in what kind of chilies do you prefer. On the tour, you’ll see examples of Pueblo Revival architecture plus some wacky homes, including one shaped like a spaceship that had William Shatner on the owner’s doorstep begging for a tour. At the end of the ride, you’ll be sworn in as an honorary Lobo, the mascot of the University of New Mexico. This tour is a lot of fun and tremendously informative. Cost: Youth (12 & under) $20; Adult $30. KidTripster Tip: Another reason for taking this tour at the beginning of your visit? ABQ Trolley gives you a brochure for a bunch of BOGO offers and other discounts at area attractions and restaurants. Now walk to Church Street Cafe (2111 Church St NW) for lunch. Known as Casa de Ruiz, the building is thought to be the oldest residence in the city, dating back to the early 1700s. Generations of the Ruiz family lived here until 1991; in fact, the last owner’s grandmother is buried under one of the dining rooms! When you go, ask to have Alfonso as your server. He’s fantastic and may even give you a tour of the property. Oh, did I mention that the authentic Mexican food is delicious, too?! My son recommends ordering chips and award-winning salsa. Spend the afternoon exploring historic Old Town. Centered on shaded plaza, it encompasses about ten blocks of adobe buildings dating back to the late 1700s and early 1800s which have now been converted to quaint shops, art galleries, and restaurants with long portals (porches) that offer relief from the New Mexican sun. You’ll also find Old Town’s Museum Row including the Albuquerque Musuem and the New Mexico Museum of Natural History. Range Cafe (1050 Rio Grande Blvd. NW) is one of the most family-friendly restaurants in Albuquerque. After exhaustive taste testing around the city, my teenager insists Range Cafe has the best tacos: white corn tortillas, braised beef, spicy slaw, cotija cheese, and ancho chile crema served with arroz verde, black beans and salsa verde. And the desserts… don’t get me started! Our friendly waiter served us the largest cream puff that I’ve ever seen, but it was the moist Chocolate Roadhouse Cake with chocolate fudge frosting that had my mouth watering. Seriously, it was the best that I’ve tasted in years. Our hot air balloon ride with Rainbow Ryders (5601 Eagle Rock Ave. NE) was absolutely my teenaged son’s favorite thing to do in Albuquerque, the “Hot Air Balloon Capital of the World.” It’s a true bucket lister and worth getting up early for a sunrise launch. Soaring in the balloon is surprisingly smooth and peaceful. The views are phenomenal: the city skyline, Sandia Mountains, Rio Grande River, and Chihuahuan Desert. This area is ideal for hot air ballooning because of the unusual wind flow. At night, the cool mountain air drops down to the valley floor along the river flowing in a northernly direction. But you also have southernly winds at about 500 feet. These conditions create the “Albuquerque Box,” allowing pilots to fly easily in both directions. The flight ends with a champagne toast, a longstanding ballooning tradition that your pilot will explain. It’s really a tremendous experience. Cost: Youth $99; Adult starts at $149, depending on the day of the week. Guy Fieri of Food Network’s Diners, Drive-ins and Drives was right to give a shout-out to Standard Diner, an anything-but-average eatery located in downtown Albuquerque along famed Route 66. Started by three brothers - Matt, Cris, and Vince DiGregory - the restaurant takes creative license in giving traditional comfort food a unique and utterly delicious twist. Grab bunch here before heading out of town. You arrive at the Sky City Cultural Center & Haak’u Museum where you can purchase tickets for a 2-hour tour; you only can visit the pueblo on a tour. A shuttle bus takes you to the top of 367-foot mesa where the village is located. Dating back to 1150 A.D., Acoma is the longest continuous settlement in North America. About a dozen families live here today, still without running water or electricity. According to our guide - a young woman from the pueblo who lives in a nearby town - there are 500-plus homes total; members come to their family home for feast days and other celebrations throughout the year. Over the next two hours, you learn about the bloody history with Spanish colonizers. You learn how houses are passed from mothers to their youngest daughters in this matriarchal society. And you see the San Estevan del Rey Mission Church and the tall white ladders that lead to kivas, sacred chambers reserved for men. At the end of the tour, you can take the shuttle back or walk the ancient stone stairway down, the same stairs used for more than 900 years. Cost: Youth $17; Adult $25; Family (2 kids, 2 adults) $66; Mission-only tours also are available, but honestly, the mission was the least interesting part of the whole tour for my son and me. 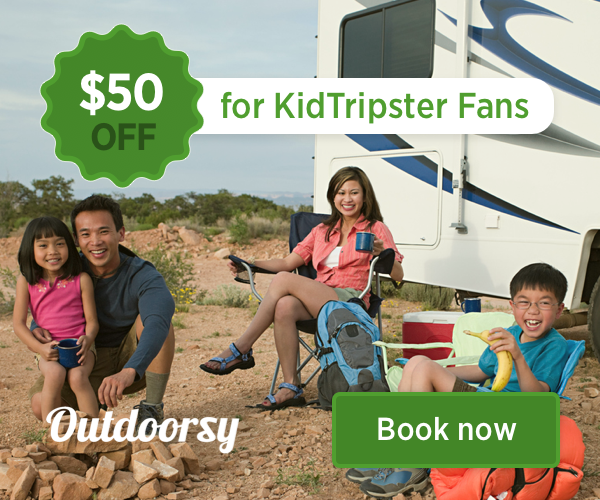 KidTripster Tip: The ticket price includes a camera permit, so you can take photos. However, you’re told to ask permission before photographing any pueblo members; video is strictly prohibited. Now head back to Los Poblanos Inn & Organic Farm (4803 Rio Grande Blvd. NW) back in Albuquerque. I’m not exaggerating when I say that a stay here is alone worth the trip to New Mexico. This historic inn was originally the home of Senator Albert Simms from New Mexico and his wife, Congresswoman Ruth Hanna McCormick from Illinois. In 1934, the adobe casita was transformed and enlarged by John Gaw Meem, New Mexico’s most influential architect and father of the Santa Fe style. Today this sprawling estate has a ballroom, greenhouse, restaurant, farm store, and multiple lodgings - all surrounded by lush gardens and fields of lavender. Los Poblanos is a working lavender farm, so high season here coincides with the purple blooms in mid-June and the harvest in mid-July. Rates during peak season run $230 to $250/night; during low season (November through February minus holidays) rates run about $205/night. While you’ll find rooms in the historic inn, I’d actually recommend staying in the South or North Field rooms. They’re larger and beautifully decorated in cheery yellows and subtle grays. A room with two queen beds is equipped with a wet bar, mini refrigerator, French press coffee maker, large closets, and fireplace. The bathrooms are spacious with both a walk-in shower and tub plus an assortment of Los Poblanos toiletries. Grab your swimsuits and head to the saltwater pool. You’ll also find lawn games and bocce ball courts on the property. Campo in the casual, fine dining restaurant located at Los Poblanos. Executive Chef Jonathan Perno is multi-year James Beard semifinalist for Best Chef in the Southwest, specializing in Rio Grande Valley cuisine that sources ingredients from the on-site farm in addition to other local farmers and herdsmen. The dinner experience is probably best reserved for foodie teenagers who can appreciate entrées priced between $20 and $43. Reservations are strongly suggested for dinner. Alternatively, you could head to nearby El Pinto (10500 4th St. NW). It has a 53-year-old tradition of serving authentic, green chili-based cuisine that helped put New Mexican cuisine on the map. It’s other claim to fame? El Pinto is the largest restaurant in the state with capacity to serve a thousand people! However, you wouldn’t know it. Despite its size and ability to handle large groups, El Pinto has divided the property into smaller, more intimate spaces - including five beautifully landscaped patios with rows of hanging chilies and an impressive tequila bar with a selection of more than 160 tequilas. Can you say margarita?! El Pinto’s red chili ribs have been featured on Food Network. But a word of warning: whatever you decide to order, get your red or green chili sauce on the side, just in the case the heat is too much. End your day with a ride on the Sandia Peak Tramway (30 Tramway Rd. NE). My family and I aren’t always fans of tourist trams, but the sunsets are so spectacular nearly every evening in Albuquerque, we made an exception. Once you board the tram, it’s takes about 15 minutes to travel 2.7 miles to the observation deck atop 10,378-foot Sandia Peak. Once the sun sets, hang tight; the color display usually gets even better within a half hour. Cost: Youth (under 5) Free; Youth (5-12) $15; Youth (13-20) $20; Adult $25. A complimentary continental breakfast of fresh fruit, yogurt, and house-made granola is served at Campo, in addition to a made-to-order menu. Sit outside on the patio. A roaming peacock may just join you for breakfast! KidTipster Tip: Just a short 1/4-mile ride from Los Poblanos, you can jump on the paved Paseo del Bosque Trail that hugs the Rio Grande River for 16 uninterrupted miles. But don’t get too ambitious. If you’re visiting in the summer, it gets pretty darn hot, and despite the fact that bosque means forest, you’ll find no shade while biking. This writer received some complimentary stays. activities, and meals for the purpose of this review. However, all opinions expressed are solely her own.